We originally shared the news of the new Evening Honeymoon or Romance package with you in March of 2017. Today Disney Destinations has confirmed that this option will be available through September 30, 2019 with Happily Ever After Fireworks Dessert Parties. Are you celebrating a honeymoon or romantic getaway at Walt Disney World® Resort? You can make it even more special with one of the limited-time Enchanted Evening Honeymoon or Romance package options now featuring the Happily Ever After Fireworks. Effective today these Enchanted Evening options are available to book through September 23, 2019 for travel September 30, 2019. Please remember this event opens at 180 days out for booking. Effective as of May 2018 the price for each package is $196 per couple. 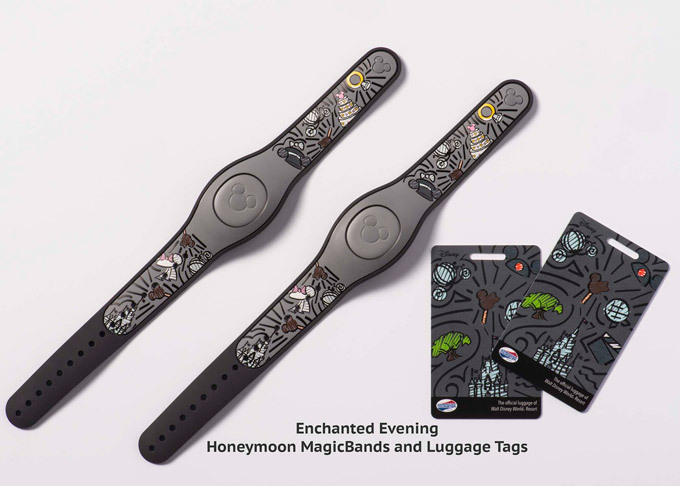 Please note the Enchanted Evening option can be added to any Walt Disney Travel Company Walt Disney World Resort Hotel package, including runDisney Marathon Packages. Please know a Walt Disney Travel Company Magic Your Way Package is defined as a room/ticket, room/ticket/dining, or room/dining package cash reservation at a Walt Disney World Resort, these reservation numbers start with the number one. The Enchanted Evening package option can not be added to Room Only or Disney Vacation Club reservation points stay. It is not available at the Walt Disney World Swan and Dolphin Hotels, the Four Seasons Resort Orlando at Walt Disney World Resort, Disney Springs Resort Area Hotels, Walt Disney World Gateway Hotels or Walt Disney World Good Neighbor Hotels. Can Guests select one of the standard solid MagicBand colors instead of the Romance MagicBand? 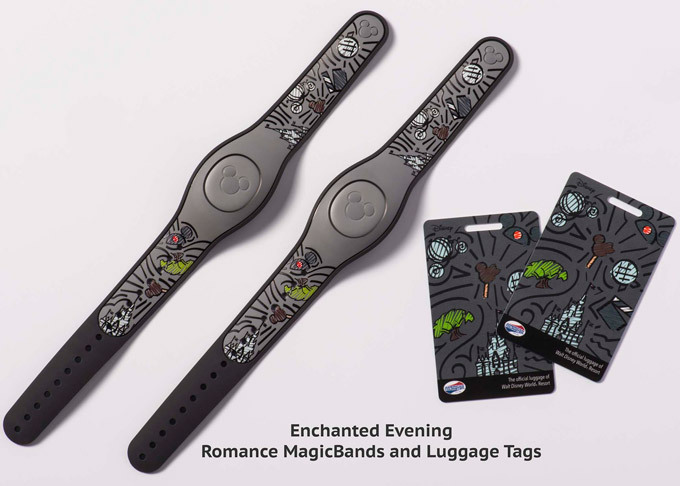 To receive the exclusive Romance MagicBands, Guests are encouraged to create or sign into their My Disney Experience account at disneyworld.com to link their package reservation. Is there reserved seating for the Fireworks Dessert Party? Guests will have a confirmed reservation at the dessert party on their desired date as part of their package reservation. Seating is open, so it is recommended Guests arrive early if they have a preference for where they would like to sit within the party. This will allow you to sit with friends and family who book the standard Happily Ever After Plaza View Dessert Party. What is the special treat that is given at the Fireworks Dessert Party? A special treat from the Ganachery including 6 handmade chocolate ganaches featuring Cinderella’s Coach in a small white box with a ribbon holding a silver-toned key charm and a special message. Is the Fireworks Dessert Party special treat customizable? The special treat is not customizable. Can this add-on be purchased for more than two Guests on the same package? Yes. All Guests would have the option to receive the exclusive MagicBand and would receive admission to the Fireworks Dessert Party. Only one special treat would be provided at theFireworks Dessert Party. Does every Guest on the package have to purchase this product? No. Guests just need to specify which members of their party will participate in the Enchanted Evening experience. Blockout Dates are as follows. Please remember this event is also not available for booking on nights that have special events, private events, or when the event is already sold out. Block outs dates apply during special event nights in the Magic Kingdom. Seats are limited. These Enchanted Evening package options can be added to Walt Disney Travel Company Magic Your Way Packages. The Fireworks Dessert Party is available seven days a week, excluding blockout dates. Magic Kingdom Theme Park admission is required and is not included. If Guests wish to visit other theme parks on the same day their Magic Your Way ticket needs to include the Park Hopper Option. Enchanted Evening option must be booked a minimum of 7 days prior to arrival.